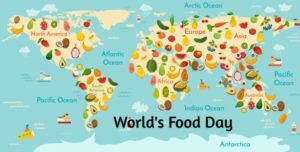 World Food Day (WFD) was established by FAO’s Member Countries at the Organization’s 20th General Conference in November 1979. The Hungarian Delegation, led by the former Hungarian Minister of Agriculture and Food Dr. Pál Romány, played an active role at the 20th Session of the FAO Conference and suggested the idea of celebrating the WFD worldwide. It has since been observed every year in more than 150 countries, raising awareness of the issues behind poverty and hunger. 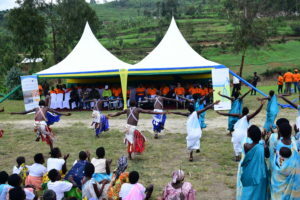 Since 1981, World Food Day has adopted a different theme each year in order to highlight areas needed for action and provide a common focus. The 2018 theme for the WFD is “Our actions are our future. A zero hunger world by 2030 is possible”. 1982. In the United States the endeavor is sponsored by 450 national, private voluntary organizations.One example for World Food Day events is the World Food Day Sunday Dinners that Oxfam America sponsors in collaboration with several other non profits. Emeritus Archbishop Desmond Tutu and author Francis Moore Lappe have teamed up with Oxfam America to promote World Food Day Sunday Dinners. The Iowa Hunger Summit has been held on or near World Food Day since 2007, and is organized by the World Food Prize in conjunction with their annual symposium in Des Moines, Iowa. In Italy, ministries, universities, research agencies, international agencies, and NGOs have organized many conferences as well as exhibitions and symposia. The Italian Ministry of Agriculture and Forestry Policies organized a meeting which focused on women’s rights in rural areas in 2005. A country which still suffers nutritious food depravity despite the huge existing opportunities to become a food secured nation. The United Nations Children’s Fund (UNICEF) in July 2016, claimed over 2.5 million Nigerian children were suffering from severe acute malnutrition. Similarly the Food and Agricultural Organization (FAO) of the UN had reported that some 7.1 million people are now severely food insecure across four countries including Cameroon , Chad , Niger and Nigeria.These levels of food insecurity arise from the high cost of food commodities across the nation , lack of infrastructures , high cost of production , poor / lack of storage facilities , lack of markets , limited / non -existent extension officers across the states , poor security of lives occasioned by insurgency in the North East , and the constant clashes and invasions between farmers / herds men , poor / insufficient fertilizer (this is despite the Presidential Fertilizer Initiative ) introduced by the present administration to supply fertilizer at ₦5,500 to farmers . Other issues include the continual importation of agric commodities which denies local farmers access to markets, natural disasters including flooding and the unmitigated effects of climate change, aging population of farmers and use of crude methods of production among other issues.